The next evolution of the viable XD platform, the Mod 2 redefines ergonomics to make the XD a more user friendly system for a wider variety of individuals. Key features include an overall improved interface between the shooter and the gun with use of Grip Zone technology that utilizes three different texture patterns, each engineered for a specific purpose. A re-contoured slide and frame, high hand beavertail, and a no snag trigger guard combined with the enhanced Grip Zone make this one of the most ergonomic carry pistols available. Accepts standard XD magazines. Comes with one 16RD extended magazine with sleeve and one 13RD flush fit magazine. 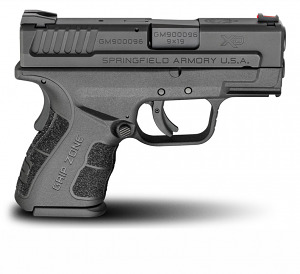 I really like the springfield armory xd mod 2 3 inch semi auto. It fits completely in my hand is comfortable to shoot and is a great addition to my handgun collection. I also recieved 3 free magizines.